This recipe for homemade Hot Apple Cider Cinnamon Spice Mix is amazing! It’s easy to make with few ingredients and makes for a perfect DIY Christmas food gift! Stir into hot apple juice or red wine for a delicious and warming holiday drink! Do you and your families exchange a lot of gifts at Christmas? Because we don’t really. We stick to small things amongst the adults and all the attention goes to the kids. Last year we bought my little baby brother a Lego airplane and he was so excited he could barely say “thank you” before he spread Lego everywhere. My niece and nephews weren’t so lucky: My sister in law forbid us to buy toys for her kids and so they each got a new bike lock and a nice bicycle bell. But this year? This year we’re the heroes because we’re the only ones allowed to give them toys. I’m probably more excited about this than the kids are. My sister in law gave me a cute candle holder and a jar full of an amazing apple cider spice mix last year. I loved it so much I hardly dared to use any of it because I was scared I’d run out of it too quickly. But of course it eventually happened and I had to recreate it in my kitchen. It makes for such a great gift that I thought I’d share it with you, along with a nice printable you can use for giving away this spice mix! This recipe makes enough to fill five 8-ounce jars. I used jam jars from Ball Jars. You can find them on Amazon here*. It’s really easy to put together with just four ingredients, one bowl and a spoon to give it a good stir. Because it’s so simple to make it’s perfect as a last-minute gift or to make with young children. The spice mix itself tastes amazing when added to hot apple cider or red wine! You can get your free printable here – I printed it 9 times onto a sheet of paper and it fit perfectly on the jam jars! Add a nice spoon and a bottle of red wine or apple juice from the farmer’s market and you’ve got yourself a lovely gift to give away this Christmas! 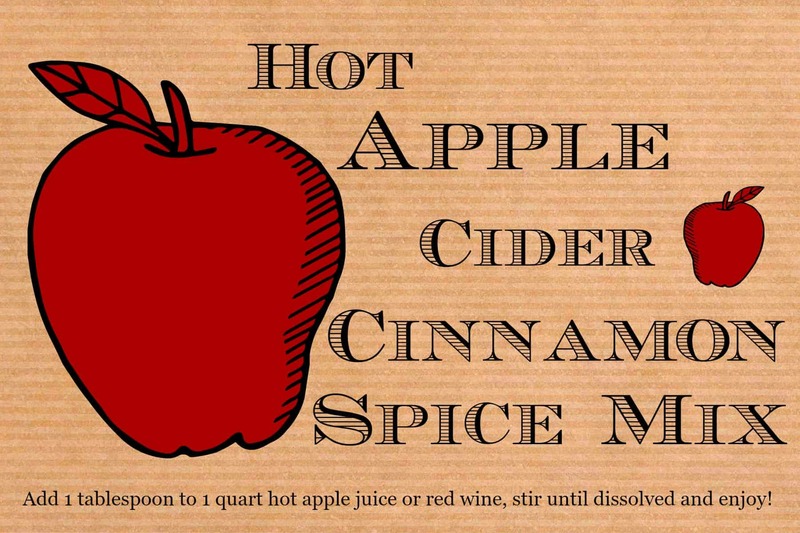 This recipe for homemade Hot Apple Cider Cinnamon Spice Mix is amazing! It's easy to make with few ingredients and makes for a perfect DIY Christmas food gift! Stir into hot apple juice or red wine for a delicious and warming holiday drink! Mix all ingredients in a large bowl and fill into individual jars. Start with 1 tablespoon per quart of juice but adjust to taste! What an awesome idea! I used to love the apple spice mix you could buy at the store, in the little foil packets – I’m sure this is a MILLION times better! Love the printables too! Mmmmm, yeah, I’m putting this in my warm wine! Yumm! Hot apple cider cinnamon would be a welcome gift in any family, I’m sure. And it’s from the heart. Your presentation is adorable. Great photo’s! What a great teacher gift =) Thanks for sharing. Love your simple Christmas traditions, sounds great. Thank you so much for stopping by Laura! My family has this month been doing 25 days of festive gift giving, and the rules are that half of the gifts given must at least be home-made… so this spice mix is definitely perfect for me Nora. Thanks for the great label too! Aw what a cute idea of your family! Thanks for stopping by Thalia! What a lovely gift idea! I love your labels, they’re perfect! Aww thank you Jess! It’s so hard to find the time to do some crafts but I love it! How much mix do you add to the Apple Juice? 1 tbsp per cup, one jar per bottle??????? Whoops, sorry, it says on the printable but I forgot to add it to the recipe! Changed that ASAP! Start with 1 tablespoon per gallon and adjust from there! It always depends on the sweetness of your juice if you need more! I love gifts from the kitchen and this is no different, especially with that sweet printable you made! What a nice touch and thank you for offering it to your readers! Very sweet. Sounds perfect for a Snow Day auction basket. What measurement do you recommend for a 6-8 ounce cup of hot water? Hi Shan, I just realized that my directions in the recipe seem to be way off, no idea what happened there! First of all I wouldn’t recommend this in hot water, as I only tested it with juice and wine. It’s delicious in warm apple juice! Try 1 teaspoon per 6-8 ounce cup, and adjust from there! Thanks for asking! Do you have any idea how much cinnamon is in an ounce? I buy it in bulk, so just curious. Hi Jenny! Thanks for asking. According to several sources it’s about 10 teaspoons, so just over 3 tablespoons. Hope that helps, please don’t hesitate to ask more questions! Have a wonderful day. What wine do you recommend? The most expensive bottle you can find 😉 No seriously, anything you’re comfortable with! We enjoy it with red wine that’s not too dry, something you would use for mulled wine maybe. Zinfandel or Merlot work fantastically. Just go for what your budget allows and make sure to only warm it up, not cook it. I hope that’s helpful, Shannon! This looks amazing and I want to make it. I get it depends on the size of jars but how many jars can one recipe fill? Please let me know so I cna but the appropriate amount of supplies. What did you use to stick these onto the jars? Hi Cassaundra. It must have been double-sided tape – hope that helps! Kristina, are you trying to print directly from Safari? I don’t think it works like that. Download the image at full size, then open it in Preview. There you can select the “print” option and then pick how many times to print per page. Pick 9 and it should work fine. Let me know if you can print the labels alright like that! Brown sugar or granulated? So 1 tsp. per 6-8 oz if you just want a quick cup? Hi Nora! Can’t wait to make this for Thanksgiving! I’d like to add some “adult beverage” with it, but I’m not a big fan of red wine. Do you think that a moscato would be good with this? Hi Lauren! I think that would taste amazing! Just make sure you don’t heat it up too much, otherwise you’ll lose all the adult effects 😀 Happy Thanksgiving! Used this mixture in a percolator with apple juice for our drama production. I was told it “tastes like warm apple pie.” Several people asked for the recipe. I shared it to our Facebook page. It was a hit! Yay Stacy, so so glad everyone enjoyed the warm apple cider!! Thanks for coming back to let me know – made my day! hi there – the struggle is real! lol I am not able to print the laels correctly – I select the 9 wallet and it prints one and some of it is cut off….. I am doing something wrong and I have 72 to put together tonite and tomorrow! have you made a lid label? not sure what I am doing wrong….any advice? these are so flipping adorable!!!! Hi Sherri, oh goodness! I hope I’ll be able to help you out here. I quickly created an image with the label 9x on it. Click here to open it. Would you mind trying to print this file and let me know if it worked, and if the label is appropriately sized to fit on your jars? And no, I haven’t made a lid label. There are so many different lid diameters, it was too overwhelming, haha! Bad weather today so couldn’t make it to the store who sold the apple cider powder so did a search to find a DIY recipe and cane upon the savory nothings site. Was making monkey bread and it called for the powder. I made the powder and am now just waiting for the monkey bread to be done. Glad it was helpful, Nancy! And that monkey bread sounds absolutely delicious.